bird peeking out of the nest at the bottom of the tree hollow on the left. We checked out the west side of the park yesterday, so looked at points of interest on the east side today. The stops here were not as eye-popping amazing, but we enjoyed ourselves immensely anyway. This day we came in fully relaxed and ready to just be. It was for the most part a lot less busy on the east side and there was always a parking space available. Most of our stops involved at least a nice walk and sometimes the point was the history of the site more than the visual experience. An avid fly fisher, Glen noticed people dropping a line at many places throughout the park and rued that we couldn't extend our stay for one more day time for him to explore his passion. Maybe next time. West Thumb is not only a geyser basin but a large, thumb shaped body of water that is an off-shoot of Yellowstone Lake. It was so large that a first glance, we thought it was the whole lake. You start at the parking lot and walk down a wooden ramp over the thermal field. Compared to the larger, dramatic sites on the west side, it’s not that impressive. However, the site flows right down to the lake’s edge. The best time to visit is morning on a still, sunny day. We reveled in the early morning serenity. Birds were singing and groups of people in kayaks glided quietly past, making me wish I was out on the water with them. The bay itself is significantly deeper than the main section of Yellowstone Lake – the result of a massive eruption. In July the water level was high, so several active spouts could be seen just below the surface of the water. I would assume late in the fall the lake level will drop and they appear above the surface. We even saw 2 birds feeding babies in a nest. I managed to catch one resting on a branch next to the babies (opening photo at top). You have to love history for this one. The parking lot is right next to the bridge. You can walk across it on one side and back on the other. On the south side, we found a shallower area with lighter sand and could see some trout, but it wasn’t easy. Bright sunshine on the spot helped. There is a museum and visitor centre on the east side you can visit, but it's not right next to the bridge. There is a path down to the river for a walk on the West side of the bridge. Trout spawn here. This bridge became so popular with fishers that they were elbow to elbow along both sides of the bridge in the past. This over fishing depleted the trout so significantly that in 1973 they had to close the bridge to fishing. 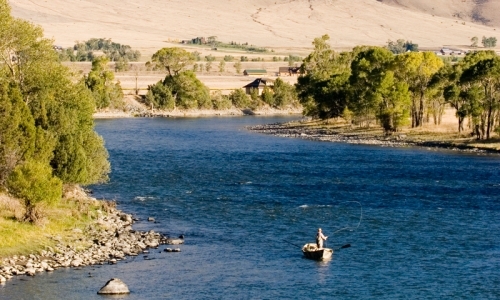 You can still fish in many areas of the park – just not here. The highlight for us here was a total fluke. As we got out of our car I could see that traffic was stopped dead on the bridge. WHY? As we got closer it became apparent. A large bison was slowly ambling across the bridge with total abandon, right down the middle blocking traffic in both directions. Of course the drivers also stopped to snap pictures through their windows and just watch. To the bison, cars were irrelevant and people uninteresting. It was if he was alone. We were in his world and he took full advantage. We laughed, but we were also glad when he chose to go up a hill across the street from us. I have these two together as they were across the street from each other. The Mud Volcano is the more interesting site but the parking is better at the Sulphur Caldron. The latter is just a small site with a couple boiling mud sulphur pots. While PH varies all through the park, they had a sign here that put this caldron's PH at a level just below battery acid. Across the street it’s a much larger site. The Mud Geyser (seems more like a bubbling pot to me) can be found to the left of the main wooden walkway along the sidewalk parking lot. Then there is a lower section on a raised wood walkway above the thermal bacterial bed where you can view the Mud Volcano and the really interesting Dragons Mouth Spring. Lastly, there is a longer walk up the hillside that offer a few additional stops – Cooking Hillside, Sizzling Rain, Churning Cauldron and Grizzly Fumarole. Unfortunately most of this trail was closed while we were there. As we explored the lower section, we noticed a bull bison resting below the walkway right on the thermal field. Not far ahead, the female bison was up behind a fence on a closed pathway just watching us all – totally relaxed. All wild animals can be unpredictable. In the park you are constantly warned to keep you distance, so having one so close by was a bit of a concern. The rangers seemed fine, so I trusted their instincts. I took 2 videos here. One was the bubbling Mud Cauldron (above). The second was of the Dragon’s Mouth Spring. It was a small cave that the sulphuric gray mud bubbled out of. The sound it made really did make you think a dragon was stirring inside. Then the piece de resistance was a steady stream of steam flow out as if from the dragon’s nostrils. Loved it. My apologies - this one needs to be turned too. No time today. We trusted the Top 10 Things To See List which suggested the Tower Fall was a must see, we skipped seeing the Upper and Lower Falls here. Big mistake. They are much bigger and more impressive. However, we wanted to take the North Rim Road so we could stop at the Grand View Lookout. It was amazing. But the fall stops on this route were either at the top of a falls or just not a great view. I think to see these falls it might be better to take the South Rim Road which crosses to the other side of the Yellowstone River. You’d be further away, but at a better angle. 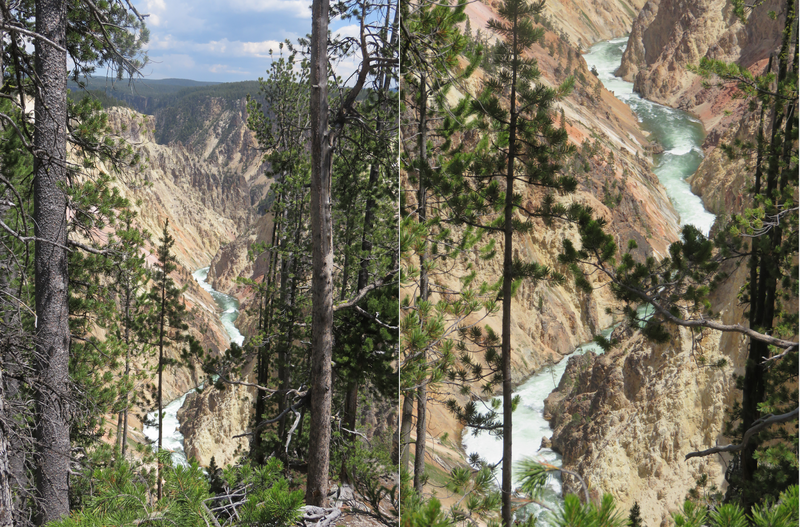 The view of the canyon and the Yellowstone River at the bottom was wonderful from the Grand View lookout. I was in awe. If you’ve seen the real Grand Canyon, this is nowhere as deep, but it’s still magnificent. There was another view we meant to check out called Inspiration Point, but unfortunately we missed it. A misunderstanding on our part. If we return, it will be our first stop. The only difficulty visiting this area was the road is small and has 3 parking lots along it serving 3 viewing places (we stopped at the last). Because of the parking difficulties in other areas, everyone entering stopped dead at the first lot trying to immediately find a space. As soon as you got halfway through the first lot, it became clear there were lots of openings and it all settled down. So a bottleneck for the first 20 feet and then fine after that. mile walk down to the bottom of the falls that might have made it a star attraction, but it wasn’t open all the way. You could get down to the river, but nowhere near the falls itself. 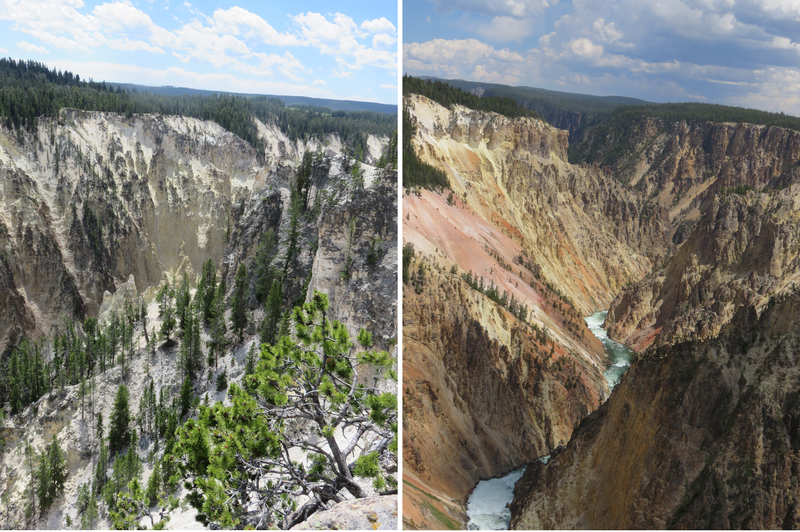 We wished we’d gone to the other side of the Yellowstone and checked out the view of the larger Upper and Lower falls instead. Live and learn. That said, I don’t have any personal experience of the best viewpoint for these two falls. We headed back to the hotel around 4 p.m. As it was so early, Glen popped into a fly fishing shop in town where he bought a license and snagged a map. After an hour of down time, he headed out to a site along the local Yellowstone River where he spent two happy hours fly fishing, He caught four White Fish (not a big deal) and one large Trout (a truly big deal and the highlight of the day for him). Tomorrow we have one last brief stop in the park in the morning and then we’re on our way to South Dakota.